Thank you to everyone who played a part in yet another successful day at the Cuckoo Fair! We raised a wonderful amount of money towards the upkeep of our beautiful but expensive to maintain parish church. to those people who made chutney, who telephoned, those who made or provided food or money and to all those who helped on the day with getting the hall ready, food preparation, serving, washing & drying up, making tea, selling bacon rolls, collecting money and clearing tables. The quality of the food this year was even better than last year – the visitors were lavish in their praise! It was a very happy day of Christian fellowship; if you were not there you really did miss out – but - there is always next year! 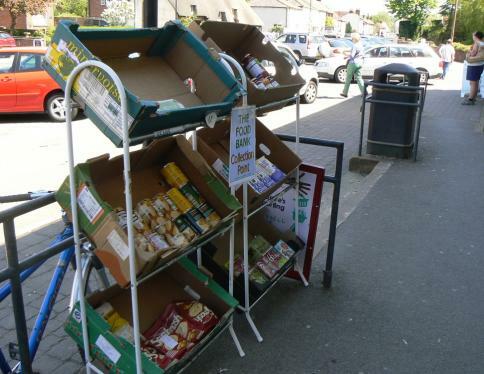 One of the charities we regularly support is the Trussell Trust in Salisbury, which works to help local communities to combat poverty and exclusion in the UK and Bulgaria. The Trussell Trust runs a network of over 250 foodbanks, including one in Salisbury, which provide a minimum of three days emergency food and support to people experiencing crisis. In St Laurence Church we have a regular collection of tinned and dried food which we take to the Trussell Trust on a monthly basis. 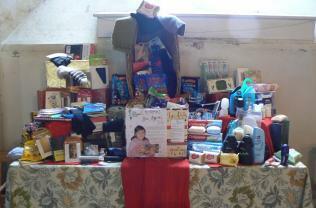 Items can be brought to church or to The Vicarage in Barford Lane. A list of suggested items is on the Trussell Trust website. We also respond to special appeals including the Christmas Shoebox Appeal, collecting gifts to give to some of the poorest people in Bulgaria. at Christmas supported the Shoebox Appeal for Bulgaria and donated special Christmas foods to help local families in crisis in and around Salisbury to celebrate the festive season. Thank you to everyone for your continuing support. last November, and of Christmas goodies and other food for the foodbank. - a record-breaking 6,657 shoeboxes were delivered to men, women and children in poverty in Bulgaria! - over 20,000 people across the UK were helped by foodbanks in the two weeks leading up to Christmas. Thank you also for your continuing support of our regular collection which we deliver to The Trussell Trust in Salisbury on a monthly basis. Last October The Trussell Trust revealed that a record-breaking 100,000 people had received emergency food from UK foodbanks in just six months, so our continuing support is much needed and also much appreciated. The Trinity FUNders team were very pleased to have the support of members of the congregation and their fresh ideas during 2011. Also we shared our jumble sale profit with the Downton Royal British Legion. This was greatly appreciated by the Legion and it turned out that we made around 25% more profit than we had in previous years. The amount raised toward the Diocesan loan of £20,000 stood at £18,119.00 as at December 2011. In addition we have paid over £800.00 in interest. Since then we have had donations in excess of £555.00. Although the FUNders team are ‘resting’ for 2012, and other events are being organised to bring in general funds, we do encourage everyone to continue to run events for the heating and ensure the profits are clearly marked ‘FUNders Event’. Let Sue Stanley know about these events and they can be publicised here on the Church website. Also we have 5 notice-boards, in gardens, throughout the village for posters. St Laurence’s church’s everyday finances are in a tricky position. Therefore in 2012 - a busy year anyway with the Olympics and Queen's Diamond Jubilee - events will be held to raise funds for the everyday needs of our church and it has been decided to ‘rest’ the FUNdraising for the heating FUNd until 2013. The loan from the Diocese will hopefully be very close to being settled after the next few FUNders events, already scheduled for 2011, in any case. Especially with everyone's support for these events please. HOWEVER we DO still encourage individuals and friends to continue with the coffee mornings, bridge drives and other activities for the FUNders FUNds. Please make sure you advertise these as FUNders events and all profits are marked as FUNders money when giving to the treasurer. Let us know too please!! Please continue to fill your model churches with change and notes and bring to church regularly, Please place them in the collection place by the altar when arrving in church for the service. Also, for those who buy online, please use our page on www.easyfundraising.org.uk and the heating FUNd benefits from FREE money at no extra cost to yourselves.